4/15 Update: This contest is closed. We thank all the entrants and especially the winner of the prize pack, J. Woltz of Newark, New Jersey. 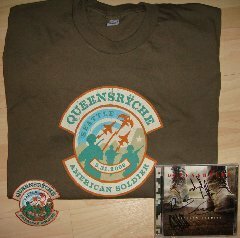 Queensryche, and NeuFutur Magazine are giving one lucky reader a Queensryche Prize Pack which includes a copy of their new (3/31 release) album “American Soldier”, a patch, and a shirt. All that individuals need to do to be considered for the contest is to email neufutur@gmail.com with an email that simply reads “Queensryche”. The contest will end on 4/7, and a winner will be picked soon after.